Anyone who is wondering how to lower cholesterol without drugs may be on his or her way to the right path – the path of healthy living, that is. 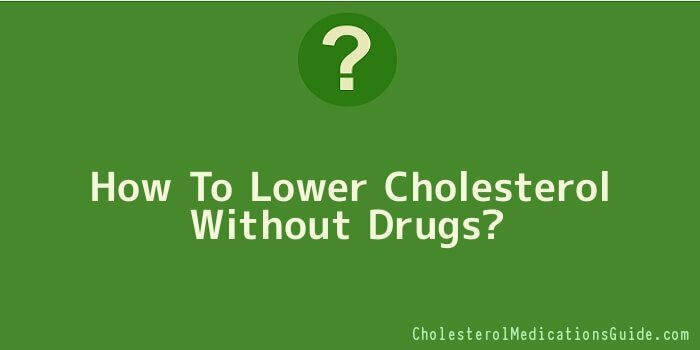 After all, medications used to lower cholesterol levels should only be considered for extreme cases for people who already have health complications arising from high cholesterol levels, or senior citizens who might not typically be expected to do much physical activity. Before one gets to know how to lower cholesterol without drugs, it is first important to be knowledgeable of what cholesterol actually is. The thing about cholesterol, in general, is that it has received a very negative reputation, which is unfortunate, because people may actually end up damaging their health when relying on wrong or incomplete information. Actually, cholesterol per se in the body is a good thing. Cholesterol aids in the health of cell membranes and hormone production. But as mentioned earlier, too high LDL levels can be dangerous. For one, high LDL levels indicate that there may be too much fat in the body. A diet with high levels of saturated and trans-fats may overload the body beyond its ability to regulate levels of cholesterol. Health experts agree that high LDL cholesterol levels need to be lowered, so that the risks that come along with it, heart disease to name one, can be lowered as well. What doctors recommend for a person to be healthy would be LDL levels below 100 mg (of LDL) /dL (of blood). For those with other risk factors (smokers and diabetics, for instance) the number should be below 70 mg/dL. On the other hand, HDLs are recommended to be kept high, above 60 mg/dL. Thus, when people hear recommendations that one has high cholesterol levels and should be lowered, this should be understood in connection with LDL levels. In determining effective ways on how to lower cholesterol without drugs, two concepts usually come up: increased physical activity and proper diet. For the latter, what is to be done may sound very simple: Stay away from LDL-rich food that contains high levels of saturated fat. That means a diet free of butter, cream and lard is recommended. It definitely sounds easy, but with food these days always containing simple sugars and manufactured in commercial processes, sticking to this diet is a challenge. However, it can be done, with much discipline and determination needed. As for increased physical activity, aerobic exercises may be one key in the fight on how to lower cholesterol without drugs. The connection between the levels of LDL and aerobic exercise is not entirely conclusive, with a number of studies stating that the amount of fat and weight which are loss need to be considered in order to achieve lower LDL levels. However, there are also studies that conclude that levels of LDL can be decreased by exercise, although it may not guarantee weight loss, if the exercises only result in losing 1,200 calories every week.